Sometimes, you want cake, but don’t want to buy special ingredients to make it or have an entire cake in your house. Am I right? Well, you can have your cake and eat it too with these scrumptious no-bake carrot cake bites. Not only are these grain-free, but they’re also dairy-free and date-sweetened. They’re incredibly easy to make and won’t wreck your gut either. Plus, you can’t go wrong with carrot cake, especially this time of year. It’s reminiscent of both spring and Easter, and tastes magnificent too. 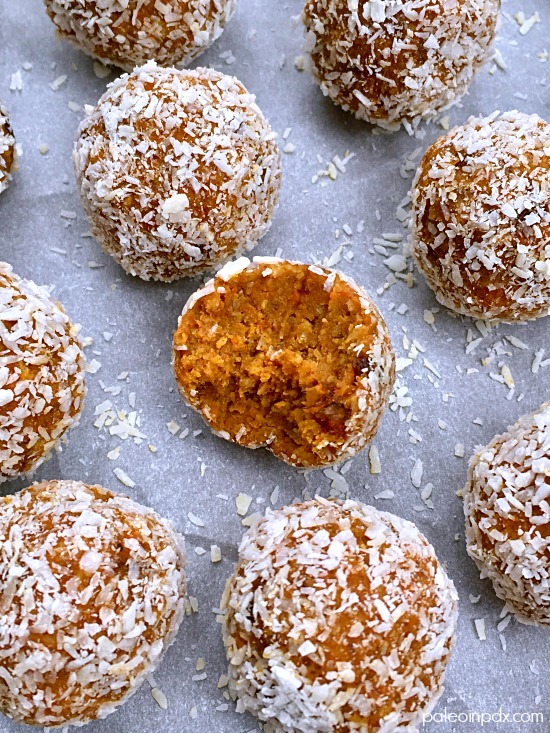 These bites are loaded with healthy fats from the walnuts and coconut, and are naturally sweet from both the dates and carrots. Not only that, but you get a dose of vitamins and antioxidants from the carrots too. The warm spices add the perfect amount of zest to these melt-in-your mouth morsels. If you don’t have walnuts on hand or just want to mix it up, try pecans instead. Also, feel free to tweak the spice ratios to your preferred taste. Luckily, you can taste along the way with this recipe, so it’s easy to adjust the flavors to your liking. Place sliced carrots in food processor bowl. Process until finely grated. Next, add all the remaining ingredients, except for the extra unsweetened coconut (for rolling at the end). Process until ingredients are fully incorporated, scraping down the sides as needed. Mixture will be sticky when done. Shape into 1-2 Tbsp sized balls with hands (I did a generous tablespoon size for the amount I yielded). Roll into extra shredded coconut, if using. Place in the refrigerator to set for at least 20-30 minutes.